Maple Falls is a small community in rural Whatcom County along the North Fork Nooksack River. It is just 15 miles from the town of Sumas, Washington, a border crossing to Canada, and sits along the Mount Baker Highway leading to the Mount Baker National Forest and recreation area. There are not many communities in this northwestern part of the state and Maple Falls makes a great stopover point on the way to hike or ski on the mountain. 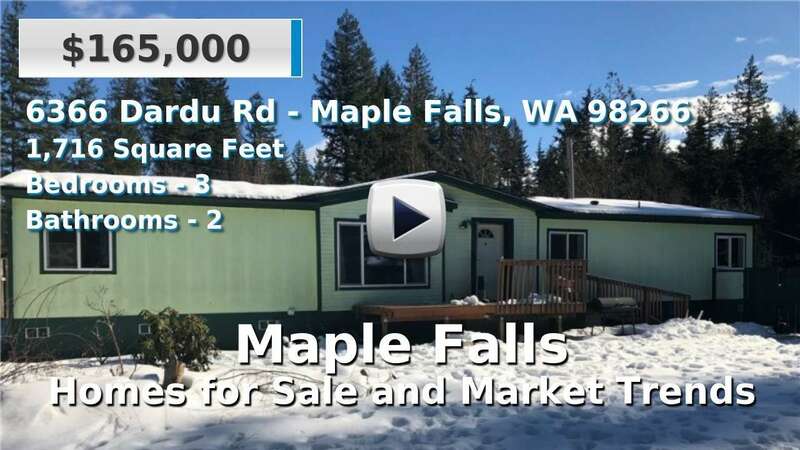 Homes for sale in Maple Falls are about the same age as national and state averages with mountain, forest, and river views. 3 Beds | 2.25 Baths | 1728 sq. Ft.
1 Beds | 1 Baths | 385 sq. Ft.
1 Beds | 0.75 Baths | 684 sq. Ft.
2 Beds | 0.75 Baths | 430 sq. Ft. Build your dream home/cabin and make this your winter wonderland and summer retreat. 4 Beds | 3 Baths | 1496 sq. Ft.
4 Beds | 2.5 Baths | 1929 sq. Ft.
3 Beds | 2 Baths | 1645 sq. Ft.
2 Beds | 0.75 Baths | 526 sq. Ft.
1 Beds | 1 Baths | 612 sq. Ft.
4 Beds | 1.75 Baths | 1836 sq. Ft.